Tortoise is my latest interpretation of what a modern archtop guitar can be. This guitar tests many concepts that wouldn't have been dreamed of by Loar or D'angelico. The multi-scale fretboard gives a good tension on the lower strings while retaining the easy playing characteristics of a short scale on the upper strings. 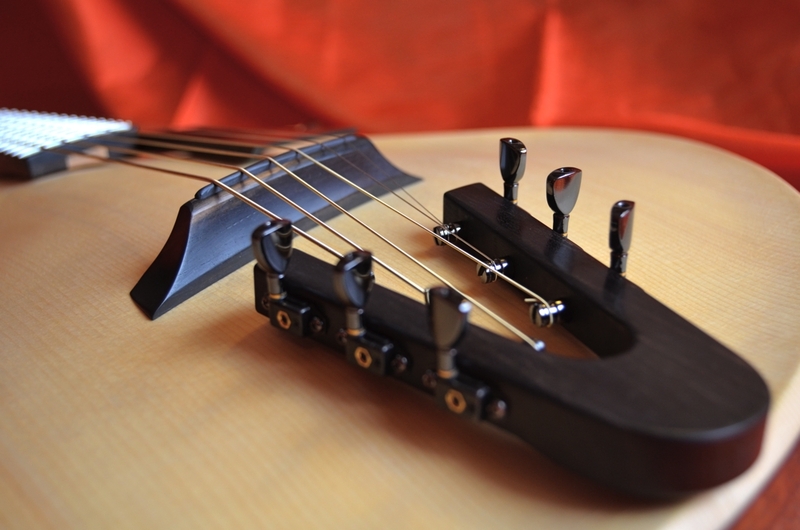 The headless design makes the guitar exceptionally compact and well-balanced, a common fault with traditional archtops. Even the body has a strong wedge cross-section from the lower treble bout to the upper bass bout. 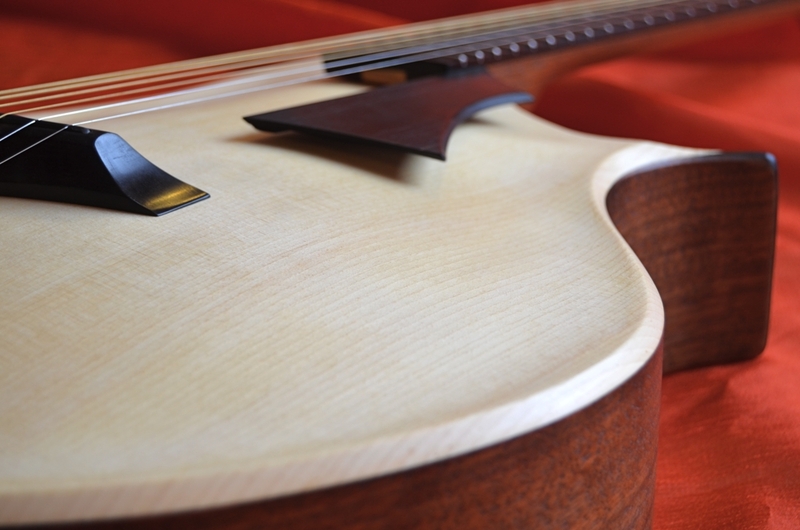 The soundhole, if it can be called that, is merely a deeper cut of the delicate chamfer running around the bindingless edges. Some other unique touches are harder to notice. The soundboard may be carved of traditional engelmann spruce, but the back is instead a flat (actually mildly domed) bookmatched set of curly maple. The sides are one continuous piece all around the perimeter, joined only at the tip of the horn. The pickup is a K&K soundboard transducer, to invisibly reinforce the acoustic sound of the instrument. To keep the tailpiece light and compact, I have used a special set of Gotoh Stealth tuners unlikely to be produced again. This unique guitar will hopefully become just the first of many more advanced archtops.